Performance enhancements in HDX with feature parity between x86 and ARM platforms. Platform Optimization SDK available for all supported platforms. HDX technologies improve the user experience when using productivity apps, viewing multimedia files, using webcams and in conference calls. IPv6 connections are now supported from XenDesktop. A new graphical user interface replaces the Program Neighborhood Agent interface. StoreFront is the new access point for users. 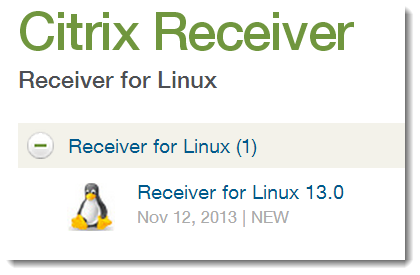 Receiver is available in English, German, Spanish, French, Japanese, and Simplified Chinese. Il client è disponibile per piattaforme ARM e Intel 32bit e 64 bit. Questo articolo è pubblicato in XenApp, XenDesktop e taggato 13.0, aggiornamento, Citrix, client, Linux, receiver, XenApp, xendesktop da Gabriele Pallassini. Questo è il suo link permanente.